Everyone lost his car key, at least one time in his life. Losing a car key is a trouble that can happen at any time, and any day. Unfortunately, losing a car key can also happen when you’re on the road. There are many reasons why one will lose his car key. For instance, the key can drop off your pocket, or you can lose it during a roller-coaster ride. When you lose your car key, you wonder who to call and what is the best way to replace your lost auto keys. You speak o your relatives and friends, some advise you to call a locksmith, and other advise you to call a car dealer. What would you do? It so confusing! On this post, we would like you to point out the differences between a professional automotive locksmith and a car dealer. With this in mind, we would like to say; it doesn’t matter what type of car, brand, and model. It also doesn’t matter what a car dealer, Ford, Chevy, Honda, or Chrysler. Sometimes, a customer tells us that a car dealer “warned” him about automotive locksmith. A car dealer told him that a locksmith can destroy his car PATS system. As well, a locksmith can damage the immobilizer or even the computer of the car. Really, that is a serious claim to accuse a professional locksmith. We thought to address this rumor, once and for all. We should know the reasons why a car dealer will say such a thing. Car Dealer – When you hire a car dealer to replace your car key, you need to tow your car to a local dealer shop. This towing service is an additional charge that cost you more in the process of replacing your auto keys. In addition, think about the time and effort you gonna invest in order of waiting to the tow truck to arrive. LockTech24/7 – We are Mobile! As mobile locksmith service, we come to your aid wherever you need us. Different from a car dealer, we stock 2 machines of car keys cutting in our mobile locksmith shop. Whatever is the car key in your needs, we’re able to cut it on site. Car Dealer – A local car dealer has a huge commercial space and many employees. This is combined with taxes on his business, utilities, bills, and more. It’s no secret that any business in this size has high monthly expenses. Customers also told us that a car dealer wanted to charge them as high as thousand dollars to replace a car key. Hmmm… Really? 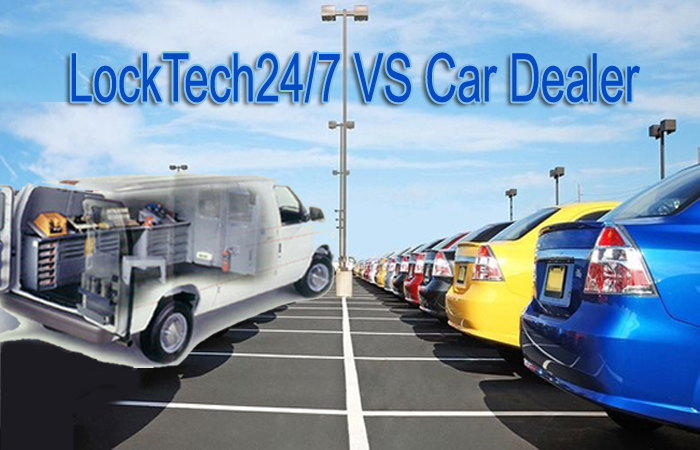 LockTech24/7 – As we said above, LockTech24/7 is a mobile locksmith shop. We do not hire contractors or subcontractors. We have no commercial space combined with high bills. Therefore, we’re able to keep low prices, in order to keep your satisfaction. 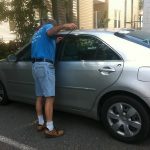 In some cases, our locksmith arrived on scene to find out our customer waiting with his credit card in hands. Later, we also found out that we quote this customer half price or even a fraction of a price that he got from a car dealer. Car Dealer – This is the biggest rumor car dealers spread out about automotive locksmiths. In fact, if a locksmith can damage the PATS system of your car, so be a car dealer. In regards to electronic devices, a car dealer can also “damage” the immobilizer of your car if he won’t be able to program the key out of a glitch in your anti-theft system. LockTech24/7 – In reality, and as a matter of fact, we never damage a PATS system of any car. We use the best programming machines in the market today, as well as cutting machine or other auto locksmith tools. Car Dealer – It’s important to realize that all car dealers are able to get key codes back 10 years from the current time you need a lost car key replacement. For instance, we’re in the year 2017. If your car was made in 2006, and older, a car dealer can no longer make your car key. LockTech24/7 – This is not the case with LockTech24/7. We’re able to get key codes of an older car. Perhaps you ask how old? Well, some of the cars can go back, all the way to 1996 or even 1990. As long as the ignition of your car was never changed, there shouldn’t be a problem to cut your auto key by code. Car Dealer – A car dealer makes car keys of the vehicle factory he represents. For instance; a car dealer of Chrysler makes car keys only for Chrysler, Dodge, Jeep, and Plymouth. A Chrysler car dealer won’t make keys of Ford or Toyota. LockTech24/7 – We, on the other hand, are able to make car keys of almost all car brands and models on U.S roads. Different from a car dealer, we’re able to provide car keys of Ford, Honda, GM, Toyota, Nissan, and many more. Car Dealer – Considering your time while having a dealer make your car keys has a few aspects. Towing your car to a local dealer shop can take 1-2 hours. Waiting for service in the car dealer shop can take another few hours. That means, in order to get over a lost key problem, you need to waste half of your day. LockTech24/7 – This is not the case again with LockTech24/7. We, different from a car dealer, offer 20 minutes time response to arrive on site, and an additional 30-60 minutes to make your car key. Yes, you read it right. After one hour, on average, you can go back on the road. Be that as it may look like, there are so many differences between an automotive locksmith and a car dealer. We proud to help customers, especially when they stuck on the road. Perhaps, a legitimate and professional auto locksmith is too much for a car dealer to handle competition with. 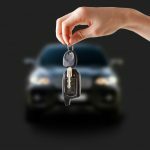 In short, hiring a local automotive locksmith to make a replacement to a lost car key, will benefit you more than calling a dealer. Please call us for fast emergency auto keys made at an affordable price.